Knowing God’s unconditional, no obligation love for us, will radically and forever change our lives! Posted on September 30, 2012 September 16, 2016 Author EvanCategories Grace Audio/Video MessagesLeave a comment on God’s Love! Hello everyone, continue in God’s grace, and watch it forever change your life! 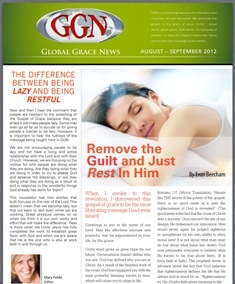 Check out the Global Grace News August-September 2012 Edition by clicking on the newsletter icon to the left. There are a couple of great articles that will really bless you! One of them I wrote, enjoy! Jesus is at Rest, Let’s Join Him! May God’s grace and peace be dominant in your life this week! I hope that as we have been studying the gospel of grace, that everyone has seen and experienced God’s grace this year like never before. I will be posting some audio messages on the blog, and we will soon begin video taping our messages again as well. We feed our bodies to keep them nourished, feeding our inner-man the gospel of grace is even of greater importance. You can expect good today, not because you are good, but because God is good. You can expect to get what Jesus deserves! That is what His grace (undeserved favor) does. Jesus took what you deserved upon Himself at the cross, so that you could have what He deserves! He took our sin, and gave us His righteousness! He took our sickness, and gave us health! He took our confusion, and gave us His peace! He died, so that you could have zoe (the God kind and quality) life! Contained in the definition of “peace” is safety/protection, health, prosperity and rest. These things are already ours in Christ. (The chastisement of OUR peace was upon Him)! If these are already ours, and they are, then let us be at rest even as Jesus is at rest. He is seated at the right hand of the father, and we are seated with Him according to Ephesians. When we believe this, then resting in Him is easy. Hebrews 4 tells us that Israel did not enter His rest because of unbelief. We’re also told in the same chapter not to let this happen to us. It is not about your right doing, or good behavior. Right believing always leads to right living. If you believe right, you will live right. Charles Spurgeon a respected preacher from the early 1900’s said “A lying doctrine will soon beget a lying practice. A man cannot have an erroneous belief without by-and-by having an erroneous life”. What Spurgeon was saying is that if your behavior is wrong, it is because there is something wrong with your beliefs. The more righteousness conscious you are, the more of God’s unmerited favor you will experience, and you will experience His rest. Reign in life today! Posted on September 10, 2012 Author EvanCategories Abundance of GraceLeave a comment on Jesus is at Rest, Let’s Join Him!